What you've been told about carpet and allergies may be wrong. Studies show carpet actually improves indoor air quality. Most of today’s carpets are made from harmless, common materials such as nylon, wool, polyester, and polypropylene fibers, which won’t trouble most people and are found in clothing and other everyday fabrics. But for people with allergies, carpet can actually be a benefit. It works this way: Carpet has an electrostatic charge that attracts particles – soil, dust, allergens – and traps them inside where they will stay until disturbed. By removing these allergens from the "breathing zone," carpet actually has a beneficial effect and acts as an air filter. Unfortunately, vacuuming is just the disturbance that can put some of those allergens back in the air but a vacuum that has a filtration system will take care of that problem. Even without filtration, a vacuum removes more allergens than it puts back into the air. With hard surfaces, allergens remain on the floor and can easily become airborne. There is one exception: dust mite allergies. It doesn't matter what you do, your home is filled with dust mites (no, you can't see them with the naked eye). Dust mites love carpet (although they love your pillow and bedding even more where they are found in higher concentrations than in carpet). If you are allergic to dust mites, then carpet might not be the answer for you since they are impossible to eliminate. These microscopic critters can cause allergic reactions, asthma and have been associated with infantile eczema. Carpet has also been wrongly linked to high levels of volatile organic compounds (VOCs). Studies show that new carpet is one of the lowest emitters of VOCs into the indoor environment, and that these emissions dissipate very quickly. The low-level VOC emissions and the harmless odor from new carpet disappear within the first 48 to 72 hours after installation with proper ventilation. Remember to open the windows during and after new carpet is installed. 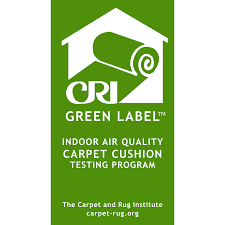 The Carpet and Rug Institute offers its own Green Label testing and certification to indicate carpet, carpet backings, cushions and adhesives that emit low VOCs. One warning: Carpet can be prone to mold and mildew if it gets very wet and is left untreated. What happens is this, the moisture wicks to the back of the carpet where it gets caught between the backing, pad and subfloor. While even this will eventually dry under normal conditions, it can become a breeding ground for mold and mildew as long as it remains wet. If you're very concerned about this, there are several carpets that come with antimicrobial treatments that inhibit the growth of mold and bacteria. The Carpet & Rug Institute's Green Label program tests carpet to be safe from VOCs. GreenGuard certifies products with low VOC emissions.